People don’t usually win by betting against Apple as Apple has shown the world so many great products in recent years. But I am going to join a critical Oscar editor and take my chance and bet my $1 against Apple. I say Apple may have materially damaged its Final Cut Pro brand/lovemark by giving Adobe and Avid some meaningful chances into retake some of the long lost market share. Assuming Adobe and Avid have good products and execute their plans well. In fact, I am willing to go out on a limb and say Apple is giving “losers” Adobe and Avid new chances to refight their Battles of Waterloo in the field of video editing software. In the battlefield, your opponents are usually not too kind in letting you fight again and learn from your previous mistakes. 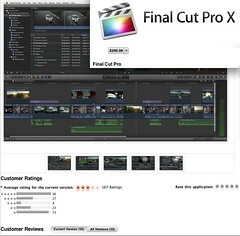 I think Apple has very much underestimated the influence of professional editors on prosumers and new beginning editors. For me, I remember years ago one of the reasons I took Final Cut Pro seriously and bought into it was because of FCP was being highly regarded and used by the professionals. OK, NBA players have been locked out, but imagine if a brand of basketball shoes have been founded to restrict certain shots/moves by NBA players thus making them unable play their best games, will you still buy the shoes? As my friend like to say, the following is my brand of poison/observations. Readers beware. Adobe is smart and quick to launch a Premiere SWITCH campaign (note: press release here, 50% off Production Premium or Adobe Premiere Pro “if you own Apple Final Cut Pro or Avid Media Composer with offer code SWITCH. Offer ends September 30, 2011”) making its Production Premium software costing $850 and Adobe Premiere Pro software costing $400 respectively after discount. [HT Apple Insider] Update: See also PC World review of software. The Production Premium software has quite a number of useful & powerful softwares and can be a good fit for professional/prosumer FCP7 users. Given Apple‘s willingness to give up its professional users, it makes sense for professional to buy and learn it for risk mitigation/management purpose. Of course, at $850, it is a bit out of reach for people who can only afford the FCPX $299 prices. 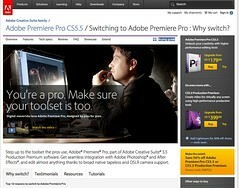 3) Adobe Premiere Pro on SWITCH discount at $400. Why $400? Now moving on to Adobe Premiere Pro, if Adobe is smarter, they should just lower its price to $299 to match the FCPX price for new purchase! Plain and simple with some solid source reference articles about Sh*t Harper Did. 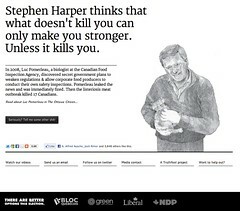 “Stephen Harper thinks that what doesn’t kill you can only make you stronger. Unless it kills you. In 2008, Luc Pomerleau, a biologist at the Canadian Food Inspection Agency, discovered secret government plans to weaken regulations & allow corporate food producers to conduct their own safety inspections. 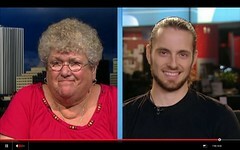 Pomerleau leaked the news and was immediately fired. Then the listeriosis meat outbreak killed 17 Canadians. Here is their “Ben Mulroney Not Endorsing ShitHarperDid.com“. Other videos: check out this, this, and this one with some strong language. Since last year, I’ve grown to enjoy and admire Kazuhiro Soda’s observational documentaries very much (love Campaign & Mental). In the summer of 2009, DMZ Korean International Documentary Festival in the border city of Paju, South Korea, commissioned Soda to make a 20 minute-short documentary about peace and coexistence which has now grown into a full length documentary. Soda originally wasn’t too keen on the idea of making a film on a board topic like “peace and coexistence“. But while shooting footage of his father-in-law and mother-in-law because Soda has always been interested in their work (respectively running an affordable taxi service for the elderly and disabled, and running an non-profit organization that sends home helpers to houses of the elderly and the disabled), Soda got the idea of making the feature-length documentary PEACE. Soda’s observational documentary style was key because he prohibited himself from doing any research or meeting prior to shooting to avoid having preconceptions. The film was partly financed by DMZ KIDF and it was scheduled as the opening film for DMZ KIDF. Three people and stray cats are the main characters. Toshio Kashiwagi runs an affordable taxi service for the disabled and the elderly, having retired as a principal at a special school. Meanwhile, he feeds a group of stray cats everyday. However, there is a growing tension in the cats’ peaceful community because a male “thief cat,” an outsider, is trying to invade it. Toshio’s wife, Hiroko Kashiwagi, runs a non-profit organization, which sends home helpers to houses of the elderly and the disabled. But, her organization is facing financial difficulties because of budget cuts from the government. At home, she has been grumbling about the way Toshio feeds his cats. Peace and coexistence are big and abstract ideas that are difficult to turn into a documentary without being too semental and corny. I think Soda’s observational documentary style worked well in dealing with the theme without making it a hard sell. The audience was able to experience the theme through the daily lives of three main characters and a group of revolving stray cats that Toshio feeds. Through the eyes of Toshio and Hiroko, we got to also see how the elderly and disabled in Japan are being treated and the challenges they face. MonopolyVote.ca campaign – Is this a win-win for Calgary (other cities), Monopoly, and other stake holders? The Monopoly Canadian edition has created itself a successful promotion campaign by creating the website MonopolyVote.ca for residents in different Canadian cities to vote to have their own cities be added to the board game. The campaign is reported in CTV Calgary tonight and CBC earlier and reported in CTV Edmonton. Is the campaign a win for Monopoly? This is an absolute and unqualified YES! The effort of creating the website and the limited marketing cost to get the press release out and other associated cost is tiny when compared to the free TV air time given for free by TV stations involved. Plus these coverage are BETTER than paid-advertising because they are reported as NEWS! Is the campaign a win for Calgary (and the other cities involved, Edmonton, Toronto, Halifax, etc)? Well, it is not that straight forward. It is unlikely tourist will want to visit Calgary (or another winning city) simply because they are on a board game. And it is not like residents in that city need Monopoly to remind them their city is great or nice to live in. Is the campaign a win for the city politicians (or former politicians) involved? Is the campaign a win for the TV news shows who air these kind of “NEWS”? Well, some may argue that fluffy news like the MonopolyVote.ca vote is a “feel nice” story for the city and doesn’t do much harm. But at the same time, marketers are getting smarter these days and can find very innovative ways to dress up their advertising, marketing and promotion campaigns as “news-look-alike” and then issue them as “news” where they often get reported as news as those smart marketers planned. Is the campaign a win for the viewers who watch these “NEWS”? Well, if the viewers simply watch these “NEWS” without thinking about the potential hidden agenda, then people may get brainwashed at the same time. And that can be bad in the long run. On the other hand, if the viewers watching these “NEWS” realize these “NEWS” are actually advertisings, and then decide to expose these types of “NEWS” and talk about these tricks, then may be viewers can learn to immunize themselves from these so-called “NEWS” in the long-run. And TV stations will learn to filter out these kinds of “NEWS”. Forewarned is forearmed. Feel free to share your personal experiences in the comments. Postscript: This reporter is very keenly aware of the irony in the additional publicity created by reporting of the website MonopolyVote.ca. If this reporter was Monopoly’s marketing consultant, the only worry would be the media completely ignoring this campaign and say nothing (good or bad) about it. 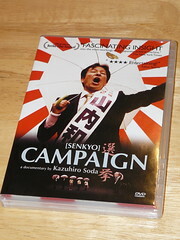 Filmmaker Kazuhiro Soda’s observational documentary Campaign is a fascinating film about one candidate’s campaign in the strange world of Japanese election. In the following Skype video interview, Soda and I chatted about Campaign, the Peabody-award winning film I love, and his latest project temporary entitled Theatre. By the way, you can watch the full documentary Campaign online at PBS POV. Highly recommended. The following time codes and descriptions will give you a quick way to revisit a topic that interests you the most. 0:53 How did Soda convince “Yama-san” and the LDP party to let him shoot the film? 5:05 Soda’s advice to new filmmaker to film an election? 6:13 Soda’s idea of an observational film and how to make an interesting documentary. 0:00 How many hours of footage did Soda shoot for his films (Campaign, Mental, and Theater)? 2:38 Talking about Soda’s editing process. 3:55 Does Soda write a script when he is editing? 5:38 Soda’s process of creating/finding logic & POV. 7:10 What does Soda focus on when he shoot? 0:37 When to start and stop recording/shooting? For example, when shooting Campaign, Mental, and Theater. 3:34 What kind of equipment Soda used to shoot? Shot three films with Sony HDV Z1. Apr 29 update: Here is a photo of Soda when he first met Yama-san at Tokyo University. Soda was only 18 years old. Canada “Take Back the Beep” Campaign ? It’s been two weeks since I started “Take Back the Beep,” a campaign to flood the four big wireless companies with complaints. I want them to eliminate (or make optional) those time-wasting, redundant, airtime-eating, 15-second recorded instructions that you hear every time you leave a message for someone (or call to retrieve your own). To my delight, the campaign has taken on a life of its own. It’s been written up on 28,032 blogs; I’ve done a number of radio and podcast interviews; and the carriers report that “thousands and thousands” of complaints have poured in. So this US campaign started by NYT David Pogue seems to be effective. I wonder what is the situation in Canada? Are we as bad and need the same campaign?